First Line: "This trip of yours is a very bad idea," Roelke said soberly. It's 1982, and against her boyfriend Roelke McKenna's better judgment, Chloe Ellefson loads her Pinto (including the copy of A Is for Alibi that Roelke gave her) and heads for Rock Island State Park off the coast of Wisconsin in Lake Michigan. Her expertise as a collections curator is needed by the folks who want to bring Pottawatomie Lighthouse back to life for all its visitors. It's good that she's needed elsewhere because Chloe is stressed out, both at work with a boss who drives her crazy, and at home with a boyfriend who wants a commitment that she's not sure she's ready to give. When the ferry lands at Rock Island and Chloe makes the trek to the lighthouse, she finds it in the midst of being restored-- ladders and paint buckets lying around, no water, and no electricity. She doesn't mind at all, and dives into the history of the place. But when she finds a young woman's body washed up on the beach, everything starts to change. At first thinking that the girl's death is an accidental drowning, Chloe keeps digging into the lighthouse's history, finding two tough, independent women that fire her imagination. Then another body is found. Has local tension over tighter fishing regulations reached flash point? If Chloe's not careful, she could find herself trapped on the island with a killer. I've been interested in the history of the Great Lakes ever since I heard Gordon Lightfoot sing "The Wreck of the Edmund Fitzgerald" back in 1976. I've loved lighthouses even longer than that, so when I learned that the action of this book would take place at a Great Lakes lighthouse, I knew I had to read it. I'm glad I did. Kathleen Ernst does an excellent job of blending the history of the area, of the lighthouse and its keepers, and of ever-changing fishing regluations that have fueled controversy for well over a century. Her setting of a lighthouse on a small remote island adds just the right touch of atmosphere. She alternates the story of Chloe in 1982 with the stories of a female assistant light keeper and a Scandinavian woman who first came to Rock Island in the 1860s-- and each story, each time frame, is equally intriguing. In fact, I was so interested in the lives of the two earlier women that--even though I enjoyed seeing a collections curator at work and I wanted to figure out who was committing the murders-- I forgot to pay close enough attention to the modern storyline and missed several important clues. If you're in the mood for atmosphere, history, remote islands, lighthouses and a strong, independent woman experiencing it all, get a copy of The Light Keeper's Legacy. Yes, it's the third book in the series, but you won't be confused, and you may even do what I did: start looking for the other books in the series. This is the second lighthouse review I read this morning, although the books are completely different. Having grown up on the Lakes, I'm always interested in that setting. It's an excellent setting for a mystery, that's for sure! I absolutely love the sound of this and have added it to my Amazon wishlist. Chloe sounds like a character I would love. Seeing she loaded up her Pinto brings back memories! That Pinto and A Is for Alibi did it for me, too, Kathy! Cathy - Oh, that combination of atmosphere, history, and a solid lead character is irresistible. I'm glad you enjoyed this. The setting sounds terrific too. Yup; sign me up. Oh, I like this cozy. 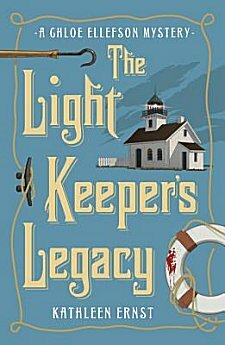 The Lighthouse Keeper's Legacy sounds like a good one for the weekend. Thanks for giving me a chance. I have pinned this! I really want to read this too! I love the Great Lake lights. There are so many of them! White Fish point is my favorite so far. Thanks Cathy! By the time I could indulge in searching out lighthouses, I lived here in Arizona, so the only ones I've seen have been on the West Coast... and Scotland! I grew up near the Great Lakes, so this setting intrigues me. I'm going to be sure to pick this up!